The government has given go ahead to the United States Agency for International Development (USAID) to conduct feasibility study for the import of 4500 MW from the Central Asian states to overcome the power crisis in the country. 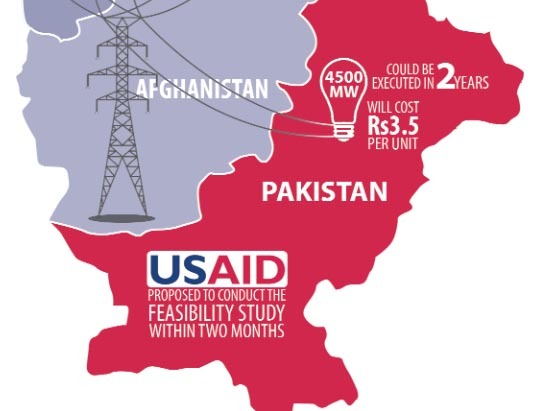 An official source said that USAID has recently approached the government with a proposal for a project named Turkmenistan, Uzbekistan, Tajikistan, Afghanistan and Pakistan (TUTAP) under which up to 4500 MW electricity from Turkmenistan, Uzbekistan and Tajikistan would be transmitted to Pakistan through Afghanistan. The proposal is extremely important considering Pakistan’s projected power supply shortage of over 5,000 MW from 2011 onwards. Importing power is would cost the least out of all the options available to Pakistan to meet its power demand. The project is expected to come online within two years. A massive addition of 4500 MW would solve all our short term problems and so we can pursue the long term projects, the source said. Under the proposed plan, USAID has sought assurance from Pakistan that it would sign a power purchase agreement (PPA) with the agency. The government would have no other financial liabilities and would receive gas at its border. USAID proposed to conduct the feasibility study itself within two months. The project would require an investment of $14 billion in power generation and transmission network through Afghanistan. USAID would arrange the investment for tapping the abundant hydropower potential of Tajikistan. It will also set up thermal generation units in Uzbekistan and Turkmenistan. The power generated in these three countries would be transmitted to Pakistan at a cost of 4 cents or Rs3.5 per unit. It is much cheaper than the 7 to 10 cents price finalised with Iran for the import of 35 MW for Makran Division and 100 MW for the coastal city of Gwadar. Pakistan’s electricity consumption is increasing at a rate of 8 per cent per annum. Low investment in the sector over the years has harmed the industry causing bottlenecks in transmission and distribution networks. The power demand is expected to increase to 25,000 MW by 2014-15, which requires an investment of over $35 billion in the next five years. Pakistan would only have to incur cost for setting up transmission link up to the Afghanistan border in order to receive electricity imports. The source said that if this electricity trade is successful power supplies could be enhanced up to 10,000 MW in the future. With regards to security of the transmission network, sources said that USAID had proposed that the local population in Afghanistan would be offered money for protecting the power transmission line in their territory. This would ensure that there is no disruption in power transmission. The same mechanism has already been implemented for the import of 600 MW electricity from Uzbekistan and Turkmenistan, which is supplying power to Kabul. USAID has also offered Pakistan to import 300 MW from Afghanistan out of the 600 MW supplied by Uzbekistan and Turkmenistan. Afghanistan has no capacity to utilise more than 300 MW. Pakistan could get the surplus in days if the transmission network was extended to the border, sources said. It is also important to mention that Tajikistan, Kyrgyzstan, Afghanistan, and Pakistan, have already signed an agreement for electricity trade under Asian Development Bank’s Central Asia–South Asia Regional Electricity Market (CASAREM). The initial plan is to export 1,000 MW from Tajikistan and Kyrgyzstan to Afghanistan and Pakistan.